In the 1920s, Tokyo high school student Hideichi Oshiro was moved by a haiku by Edo Period poet Matsuo Basho describing the subtle beauty of a wildflower he had come across during a walk in the mountains. After reading the poem by Basho (1644-1694), "I wanted to make this kind of haiku in my life. Nothing else, just one haiku," the 101-year-old Oshiro said in a recent interview at his Newburgh, New York, home, about 100 km north of Manhattan. The centenarian poet has completed much more in his lifetime than just one haiku. Oshiro, known to his friends and family as "Hide," continues to write a new poem every morning, as he has done for decades. Oshiro is also an artist and in November donated his entire life's work, totaling about 750 pieces of art, along with the many volumes of poetry he has published, to Goddard College in Plainfield, Vermont. The artworks include calligraphy, paintings, stories, handmade books, sketches and scrolls. The private liberal arts college, which is small but known for its progressive nature, has received donations before, but Oshiro's stood out because of what he said when presenting the work at its rural campus Nov. 3. "He said that the product is only important in how it uncovers for the viewer the process," President Barbara Vacarr said at her office at Goddard. "Most artists who donate their work would be focusing on the framed paintings, the product of their work, and what was so central to what he talked about was the process or development." Vacarr, a Brooklyn native, was moved by Oshiro's words and their relevance to the mission of her college, which emphasizes "life-long learning." She said it was an honor to "receive not only his gift of his work but also his gift of vocalizing . . . what is at the heart of the learning process here." Oshiro learned about the college from Carol Curri, a 1997 Goddard graduate who began working with him 10 years ago after the two met at a gallery opening in Newburgh, situated on the Hudson River. "I had been looking for a place to house his work because that was his wife's dream and his dream," Curri said during an interview at Oshiro's home. In addition to finding an institution to keep and preserve Oshiro's legacy, Curri has been gathering information with the hope of writing a book about his life story. Born in 1910 in Hawaii to parents who had gone to work on its pineapple plantations, Oshiro didn't set foot in Japan until age 3, when he was sent to live with his grandparents to receive a Japanese education. Oshiro went on to attend Aoyama Gakuin Senior High School and then Sophia University, and learned etching, ukiyo-e woodblock prints, gold carving, sculpture and brushwork. He was introduced to the famous painter Gyokudo Kawai (1873-1957), who taught Oshiro how to use a brush and motivated the young artist to study hard. Oshiro returned to Hawaii in the 1930s and taught Japanese at a school on Oahu. He can clearly remember the morning of Dec. 7, 1941, when a group of panicked students came running to him saying: "Japan attacked Hawaii! They attacked us!" At first, he did not believe it and told the children, "No, it's only war games," but he soon realized the bombs raining down on the school fields were real. "Japan attacked Hawaii and I'm an American citizen. . . . I couldn't think about anything, only darkness and doom," he solemnly said, shaking his head. The 2001 movie "Pearl Harbor" and its Hollywood "imagination" did not come close to capturing the horror of the actual events that day, he added. After spending three months in an internment camp, Oshiro chose to join the U.S. Army and was assigned to basic training in Minnesota, where he took night classes at the Walker Art Center in Minneapolis. Oshiro spent six years in the army before leaving to pursue his art career in Paris at the Academie de la Grande Chaumeirie, and eventually settled in New York City, inspired by its vitality. In New York, Oshiro met his French wife, Catherine Bullier, whom he married in 1969 and who supported his artistic journey both financially and spiritually. The couple ultimately settled in Newburgh, which had a vibrant arts community of its own. 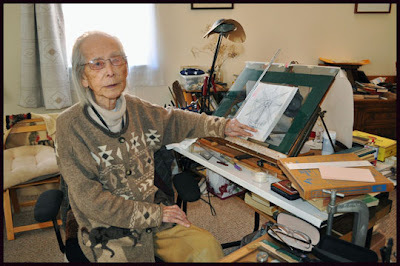 Oshiro had never formally exhibited his art, and his wife simply collected his art pieces down the years. Goddard staff remarked that his work clearly shows the artist's development. and he continues to write a haiku each day. He hopes that the school will continue its mission to encourage students in exploring the totality of life and how to fully express one's experience through art. "It's not art, it's just an expression of myself," he said. "Our mind is fantastic, it doesn't want to be oppressed. Let it be free." A Haiku a day keeps the Doctor away! And a Happy Haiku works Wonders on a Weary Soul.
. Happy Haiku - Musings about Happiness .
. Introducing Haiku Poets .